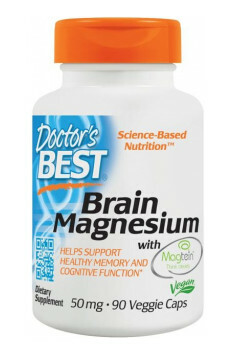 Best Brain Magnesium 90 caps. Take 1-2 capsules daily with water and without food, preferably in divided doses. Higher intakes may be beneficial, as recommended by a nutritionally-informed physician. In order to increase the assimilation of manganese, it should be taken with vitamin B6, which increases its assimilation even by 20-40%. The degree of magnesium absorption also depends on the dose one takes. Unfortunately, the higher the dose of manganese, the less of it is absorbed, therefore the recommended daily dose should be divided into the highest possible number of portions and taken at even time intervals. Every portion of this element should be washed down with a lot of water (250ml). It is caused by highly alkaline activity of these ions and possible negative influence on the stomach, the environment of which should be acidic. The presence of calcium and phosphorus limits the absorption of magnesium. These elements create along with magnesium unassimilable complex compounds and the food which is the rich source of it should not be eaten at the same time as magnesium supplementation. Dietary supplement helpful in alleviating or preventing headaches and migraines. High dose of Saccharomyces boulardii yeast. Protects and maintains a natural intestinal microflora, prevents diarrhoea. Supplement that supports Magnesium L-Threonate, which has a beneficial effect on cognitive ability.